Paul Berkovi, director at KPMG, added: "Today's vote saw a significant majority of all voting creditors choosing to approve the CVA, surpassing the 75% total required in order to pass the resolution." 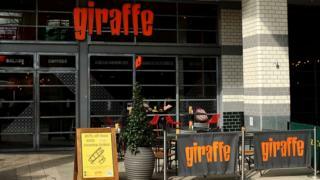 BRG snapped up Giraffe from Tesco in 2016, before combining it with Ed's Easy Diner, which it had bought in a pre-pack administration the same year. The two brands form a combined entity, which in the most recently available accounts had annual turnover of £67.1m with underlying losses of £1.6m. The company owns 70 branches of the two chains, with 17 franchised restaurants unaffected by the CVA. BRG also owns other brands, which are not involved in the CVA. These include fish and chip restaurant Harry Ramsden and the upmarket Cinnamon Collection. BRG is owned by "chicken king" Ranjit Boparan, who also owns the 2 Sister group, which supplies food to supermarkets such as Aldi, Asda, Co-op, KFC, Lidl, Marks & Spencer, Morrisons, Sainsbury's, Tesco and Waitrose. Last year, rising costs and tougher competition led to several restaurant brands shutting branches, including Prezzo, Jamie's Italian, Byron, Carluccio's, Gaucho and Gourmet Burger Kitchen.